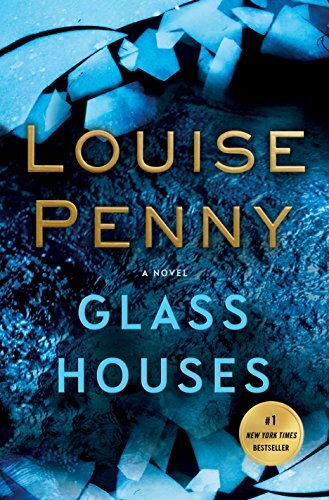 Just when one believes that Louise Penny is at the top of her game, she writes yet another Inspector Gamache (now Superintendent Gamache) novel that proves her potential isn’t even a blip on the horizon. Glass Houses is a Triple Crown winner for plot, characterization, and setting. The opening chapter finds Armand Gamache, recently appointed Chief Superintendent of the Surete du Quebec, in the witness box to testify in a murder trial, a case that seems impossible to lose. It becomes immediately apparent that more is at stake than the guilt or innocence of the defendant. The stifling courtroom in Montreal during a blistering July is far away from the freezing cold November in the village of Three Pines the previous year, when a figure dressed in long black hooded cloak and a mask appears on the village green during the annual Halloween party at the local bistro. The figure neither moves nor speaks, but stares in the bistro’s windows. Who is he starting at? A local villager or one of the visitors? Two couples, Matheo Bissonette and his wife, Lea Roux, and Patrick and Katie Evens, former classmates at the Universite de Montreal, are visiting Three Pines for their reunion. The villagers and the visitors are curious about the figure who stands motionless on the green in the sleet and snow staring at the local shops, then they become uneasy. Why is the figure wearing a mask? Why doesn’t he move? Why doesn’t he speak? The villagers want Gamache to do something. He is the head of the whole Surete after all. But Gamache can do nothing. The figure isn’t doing anything illegal. It isn’t against the law to dress up in a costume and stand like a statue in the village green even if Gamache does think he looks like Death. The narrative switches seamlessly between the testimony in the courtroom and the events the previous November. The costumed body is discovered in the root cellar of the local church by Reine-Marie, Gamache’s wife. When the mask is removed, Gamache is shocked to see that it is Katie Evans. The visitor couldn’t be the hooded figure, because Gamache had seen her in the shops when the figure was on the green. The murder of Katie Evans makes no sense. Gamache has learned that the black hooded figure that now has vanished does not symbolize Death. The figure is a “corbrado,” a collector of debts. In Spain a corbrado is dressed in coat and tails and follows a debtor to shame him into paying what he owes. But this corbrado is more ancient, and he collects moral debts, not financial ones. He symbolizes Conscience. Someone in Three Pines has committed an act so heinous that Conscience has appeared to shame him or her, but Gamache does not believe that person is Katie Evans. Gamache also knows that he has made a decision that should conjure up his own corbrado, a decision that will almost certainly result in hundreds of death. The corbrado is a bridge between the two story lines: the murder of Katie Evans and Gamache’s decision to lure the head of Quebec’s drug cartels into the open so that the Surete can finally deal a fatal blow to the drug trade. He calls together the men and women of the Surete that he trusts the most and tells them situation. Then he presents his plan to them, a plan that will destroy the drug trade or destroy the Surete and their careers, perhaps both will happen, but it is the only hope for Quebec and by extension the United States. Drugs are being smuggled into the insatiable American market by way of Quebec. What is most disturbing to Gamache, almost impossible to believe, is that the major drug trafficking route from Quebec is through Three Pines. The trap for the drug lord must be set in the sleepy, tranquil village that is more Brigadoon than the center for dispersal of deadly drugs. “Now they were close, so close to their first major victory . . . but it depended on this trial. The outcome, but also the path of it.” It depends on Gamache’s decision to break the law he has always upheld. He may yet have the black-clad figure of Conscience following him. All the wonderful and often eccentric characters one is so familiar with from previous Gamache novels are present: the poet Ruth with her pet duck, Rosa; Myrna, the bookshop owner; Clara, the painter; Olivier, Gabri. And, of course, the familiar characters from the Surete: Jean-Guy Beauboir, Madeleine Toussaint, and Chief Inspector Lacoste. Both author and character describe the village perfectly. It is not a real place, but a place that one wishes existed, a place of peace and sanctuary. Three Pines symbolizes the society Gamache wishes to save. Glass Houses is outstanding in every way, an achievement by a woman of extraordinary talent.